“The body you are wearing used to be mine. So begins the letter Myfanwy Thomas is holding when she awakes in a London park surrounded by bodies all wearing latex gloves. With no recollection of who she is, Myfanwy must follow the instructions her former self left behind to discover her identity and track down the agents who want to destroy her. Today is “Drop Everything and Read” Day … or for the seemingly more mature generation “Set Everything Down Gently and Read” Day. And to honour the occasion I thought I could offer you a recommendation that is worth dropping everything to read it. 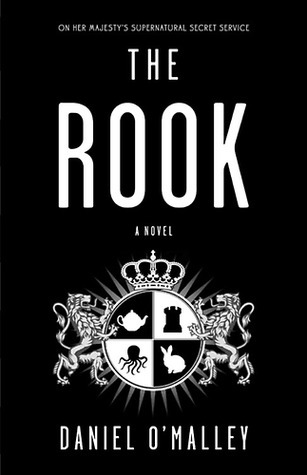 The Rook is the debut of Daniel O’Malley and plunges you right into the middle of the pool. Or rather the cold rain. Myfanwy (rhymes with Tiffany, as the reader and the character are helpfully informed right at the beginning, ignoring all Welsh knowledge you might have) has no idea who she is or why she is standing in the middle of a park, in the rain, surrounded by bodies. She only has a letter telling her that a) her memory has been wiped and b) she is in mortal danger. Luckily her former self has provided her with two well-prepared options. Either leave everything behind and start new or find out what happened. Have you ever wondered what you would do if you were offered to start with a completely clean slate as an adult with the means of a comfortable life and (almost) no danger of a guilty conscience? Myfanwy is determined to take this opportunity. Right until the moment she is attacked and her attackers suddenly crumble to the floor just from touching her. If you think that this book is centred on an amnesiac trying to get her memory back think again. Myfanwy has provided herself with a suitcase full of letters and other OCD organisation devices to access all the information she needs, but the new Myfanwy is also resolved to own this life. Throughout the book you get to read letters and files from the old Myfanwy basically dumping information but also offering insights into who she was and what her life was like. The new consciousness in her old body seems to be her opposite in so many cases while maintaining some of her character traits. This easily leads to hilarious situations with her new/old co-workers. I for one would have loved to see everyone’s faces as the formerly meek Myfanwy suddenly stands up against her intimidating colleague during the torture/interrogation scene. The story is clever and funny at the same time with a thrilling mystery and a supernatural twist. And it is set in London so I basically was a goner from the get go. But more than that I thoroughly enjoyed the well-paced and thought out plot. The narrator is very close to Myfanwy so you get to appreciate her wry sarcasm as well as her insecurities but does not make it a first person narration. Another layer of mystery is added by the first person style letters which offer insight into the organisation but at no point make the reader more knowledgeable than the protagonist. Well, you get a few seemingly free-floating scenes that let you guess but for me those only made me wonder more. I had my suspects and had them discounted and re-added several times throughout the book. There were a few moments where I thought problems resolved a little too neatly but the solutions never seemed implausible to the story universe. This is an ingenious secret service story with fantastical elements that you will soon take for granted, a main character who is re-inventing herself in a completely new way while trying to save herself and the country. 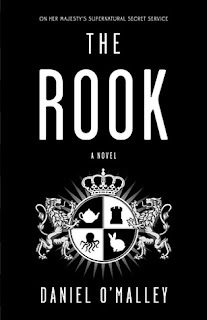 The Rook is a brilliant debut with a promising universe that I hope to get to see more from at some point. In the meantime I’ll keep an eye on @RookFiles for updates from Myfanwy.